Guys, if you are looking for the perfect engagement ring for your loving ones, you have surely learned all about the “four Cs”. We don’t want to say carat, cut, clarity and color are unimportant characteristics, but we want to point out something more important, something beyond material status of the precious jewelry. 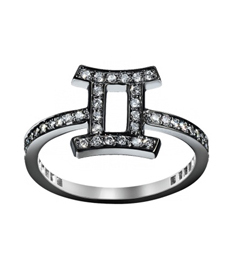 Let’s focus on the true meaning and symbolism of the ring, but from a zodiac point of view. Based on astrological perceptions, we would like to present you other four Cs. Creativity. If your loved one is notoriously creative and romantic Pisces, Cancer or Leo girl, look for a meaningful ring with a history. Forget about shopping malls and opt for estate jewelry sales, vintage styles that would definitely spark your beloved one’s imagination. Find an engagement ring that will forever remind your future bride of your commitment. Cuteness. In case you want to hear “Yes, I do” from Gemini, Aries or Taurus woman, “squeal factor” is of high importance. When you show the ring to your friends, it has to bring a smile to their faces, they need to be extremely excited by its cuteness. Character. If you want to live happily ever after with Sagittarius, Aquarius or Scorpio woman, you must have been in love with their unique character and boldness. Undoubtedly, this goes for their engagement ring, too. Your bubbly girlfriend cannot be satisfied with a classical diamond solitaire. Instead, set your sights for bold, unique stones, such as sapphire or topaz. By no means, you are a traditional couple and your engagement ring should reflect that, too. Collaboration. You are the luckiest man in the world if your future wife is Virgo, Capricorn or Libra. Well, at least when it comes to picking out the ring. The only thing you have to do is get together with your beloved one, take her hand and let her choose the ring herself. Libra has dreamed about wedding her entire life and you don’t want to ruin it with not-so-perfect engagement ring. On the other hand, Virgo and Capricorn are amazing able to spot flaws and they are extremely practical. For these reasons, leave nothing to chance and let them have a big say in the decision. You both will be satisfied!